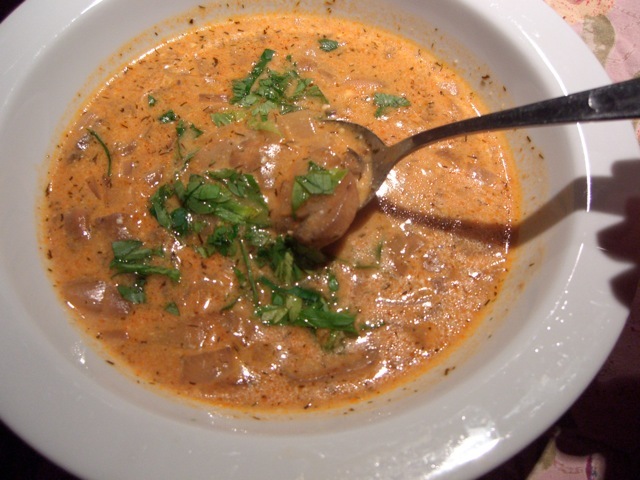 This earthy creamy mushroom soup is the perfect meal for a crisp cold fall night! One can alter this recipe with a mixture of different mushrooms varieties and change the seasoning using either Hungarian sweet or smoked paprika. The sour cream can be on the side and added as dollops by the diner or mixed in. However you fix it, it is sure to become a staple in your recipe collection. Melt the butter in a large pot over medium heat. Sauté the onions in the butter for 5 minutes. Add the mushrooms and sauté for 5 more minutes. Stir in the dill, paprika, soy sauce and broth. Reduce heat to low, cover, and simmer for 15 minutes. In a separate small bowl, whisk the milk into the flour a little bit at a time until it is smooth. Pour the mixture into the hot soup and stir well to blend. Cover and simmer for 15 more minutes, stirring occasionally. Next, stir in the salt, ground black pepper, parsley and sour cream. Mix together and allow to heat through over low heat, about 3 to 5 minutes. Do not boil. Serve immediately or refrigerate.